SB3 has the ultimate Final Four betting guide. See which sportsbooks we recommend. Next, learn the best Final Four betting opportunties. Review our historical data to identify profitable wagering opportunties. 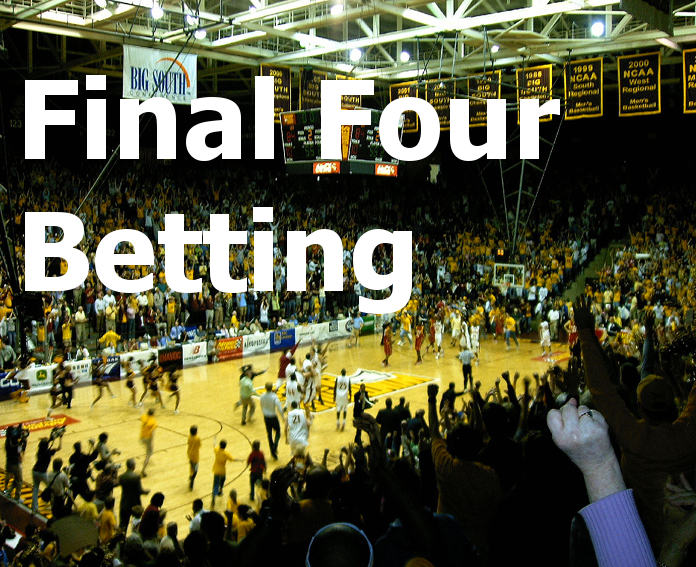 The following are popular Final Four betting options. Remember, these are the last 3 college basketball games of the season. We explain props, fading the public and common straight bets below. Carefully handicap each Final Four team. Sift through all prop bets for the best opportunities. The following are common Final Four props. Actual odds may vary. Which team will score the first 10 points? Note each team’s juice. Minus numbers indicate the most likely result. Bettors must risk the amount listed to make $100. Plus numbers indicate the least likely. Bettors must risk $100 to win the amount listed. Don’t confuse this prop with an over under total bet. A straight total bet estimates a combined total. These prop bets estimate each team’s total points separately. Look at Team Two’s number. A ½ point total means no tie bets are possible. There are only two possibilities: over or under. Compare this to Team One’s number. If the result is exactly 68 all bets tie. That means there are 3 possibilities: over, under or tie. Similar first half props might be offered. Add both team’s predicted points together. Compare this number to the game’s total line. Are they consistent? Differences may indicate line moves ripe for sharp betting opportunities. If you’ve studied the players on likely Final Four teams all season, here’s your chance to cash in. These props reward smart college basketball handicappers. Carefully match each player against the team’s opposition. For example, is it likely a player can score 15 pts against a strong man-to-man defense? Take the under. But against a zone? Take the over if they can penetrate to the paint. Likewise, can a good defensive player tally blocks against a team with more than one good shooter? If so, take the over. If not, take the under. Foul shots might be one of the easiest prop bets to take. Just research each player’s season shooting percentage, including recent tournament numbers. Read more about props here. Suppose North Carolina vs. Kentucky opens Kentucky -6. Kentucky must win by 7 or more points. First research North Carolina’s record against the spread. Check how often they’ve covered as underdogs. Second check the line. Suppose it’s moved to Kentucky -8. Remember the sportsbook wants to balance its action. Increasing the line – giving more points to North Carolina – makes taking the underdog Tar Heels more attractive. Don’t continue following the public! Take North Carolina if they’ve consistently won against the spread. Bet against the public when line moves present an opportunity! Wait until 30 minutes before tipoff to see which underdogs get money. This is sharp action coming in. Bet with the sharps. Finding good spread bets isn’t hard if you can handicap college basketball. Look for matchups where the sportsbook’s spread overestimates a favorite’s ability to cover. Here you’ll take the underdog. Also look for matchups where the sportsbook’s spread underestimates a favorite’s ability to cover. Here you’ll take the favorite. It’s OK to be a chalk eater. A small win is better than a big loss. You can identify good total betting opportunities from a sportsbook’s spread and total numbers. See our calculation here. You have an edge if the total isn’t consistent with the calculation. Review SB3’s live college basketball odds here. Also review our spread betting and total betting video tutorials. A near-perfect 32-2 season produced another win for John Calipari’s Wildcats. Coming off a SEC championship loss to Vanderbilt, Kentucky steamrolled its way to the Final Four. A 69-61 close call with Louisville, reminiscent of an epic December battle just months earlier, sent the Wildcats to the Championship against Kansas. There they finished the first half 14 points ahead, later winning 67-59. A stacked Tar Heels team featuring James Worthy, Sam Perkins and a young Michael Jordan barely made the Final Four, squeaking by a determined James Madison team in the first round. Coach Dean Smith steered them past Houston the first Final Four game, notching a five point win. Then the Tar Heels faced Georgetown in the National Championship. Foreshadowing future greatness, Michael Jordan sank a jump shot with 15 seconds to go, giving North Carolina a 63-62 lead. Georgetown turned the ball over to James Worthy on the next possession, ending their attempt to win at the buzzer. The 1982 Tar Heels are considered North Carolina’s greatest team of all time. Respect to Mike Krzyzewski’s 1992 Blue Devils, the forefathers of today’s Duke Dynasty. After a dominant 28-2 regular season, Duke was behind in its Elite 8 matchup versus Kentucky. But Christian Laettner’s legendary buzzer beater sent the Blue Devils to the Final Four. Many still hate Laettner! His last name is a four-letter word, still sour in mouths of Duke’s competitors. Duke edged by Indiana 42-37 in the semifinal game, later crushing Michigan’s Fab Five 71-51 in the National Final. Grant Hill and Laettner led Duke in final, while Bobby Hurley was named the tournament’s most outstanding player. Michigan State, Indiana State, DePaul and Penn made the Final Four. In the end, Earvin Magic Johnson led the Spartans 75-64 over Larry Bird and the Indiana State Sycamores. Topping a perfect 32-0 season wasn’t a challenge for Quinn Buckner and Kent Benson of Indiana, defeating Michigan 86-68 in an uneventful Final Four. It was Coach Bobby Knight’s first National Championship. Incredibly, #6 seed Kansas pulled the ultimate upset against #1 Oklahoma, winning the game 83-79. Danny Manning led the Jayhawks. It was Kansas’ first national title in nearly 50 years. Refresh your bankroll before Final Four Betting begins. Deposit early to avoid last minute credit card processing glitches. Monitor Final Four prop bets closely. Visit your sportsbook’s prop page regularly. Shop college basketball lines at multiple sportsbooks. SB3 has live odds here. Consider a 2 team parlay on the first two Final Four games if the numbers are favorable. Otherwise stick to straight bets only: spread, total or money line. It takes less than 1 second!